Find out what it means to me…over at My Life With Food Allergies, where I just contributed my first post. If you haven’t heard yet, it’s a new website run by Living Without magazine. It features the work of gluten-free and food-allergic writers from around the blogosphere. 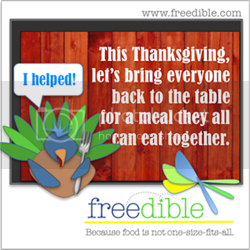 My post is about our rights and responsibilities as (reluctant) members of the food-restricted community. Do allergies or gluten sensitivity give us special responsibilities? And is one of those responsibilities to avoid making the rest of the community look bad? I touched on this topic way back when in this post about Dean McDermott, but now I’ve reopened the case. I hope you’ll check it out and share your own opinion on the matter. While you’re there, take a peek at the other posts—there’s some great stuff on the site. It also has a nifty star ranking system, so you can objectively let me know how much you love the post in a single click. Check out the post now HERE. Do we have the right to remain “picky”? You tell me! Great – I am going to go back there and read some more. This is my comment: When I was avoiding wheat and barley (because of allergies) put me in a semi gluten-free diet. Then I had to add in sulfite sensitivity, mold sensitivity (no fermented products, etc. ), and my growing list of foods allergies, I became the “picky person” who also felt the need to educate others on all the foods that could contain mold. I am trying to be better about that. Great post. Thanks for the comment, Kathryn! There’s definitely a fine line between educating and annoying. I seem to cross it daily. Well, I’m picky and proud 🙂 no gluten, no dairy (I can tolerate very occasional butter as there’s more fat than dairy in it), no soy (for other reasons). I do love avocado and cilantro though, sorry lol. Congrats on the article! It’s awesome. I think it I had celiac I’d have a harder time advocating for myself, but since it’s my daughter, I am less so – yet, still, I find myself feeling uncomfortable asking for SO much, and I hate the idea of my family being stigmatized for being picky when we’re just trying to keep our daughter safe. So thanks for rocking out that point in your article!